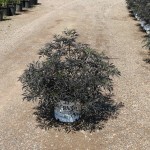 A large fine-textured shrub with lacy purple-black foliage. 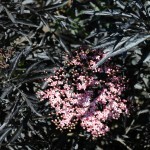 It blooms in the late spring with six inch clusters of light pink flowers, followed by blackish-red elderberries. The best color will be in full sun. For best shape and foliage, prune hard in early spring. Great as an accent or as a replacement for fine-leafed Japanese Maples where hardiness is an issue. PP 15,575.